The university has been deemed eligible by the U.S. Department of Education to compete for millions of dollars in federal grants aimed at improving student success as a federally designated Hispanic-Serving Institution. SSU has also created an Undocu-Resource Center that will provide a range of support services and help undocumented students achieve their dreams at the University. At Sonoma State, 33 percent of the university's 8,600 undergraduates are Hispanic, and the federal designation as a Hispanic-Serving Institution, or HSI, has been a priority of President Sakaki's since she arrived on campus last summer. "This is wonderful news for our students and for the Sonoma State community," Sakaki said Tuesday. "It's not enough to just open our doors to Latino students and others who have been traditionally under-represented on college campuses. We must do everything we can to help all of our students succeed and graduate. "This important federal designation will give us more resources and tools to achieve that goal, as will the new Resource Center." CSU Chancellor Timothy White stated, "I applaud Sonoma State on HSI and the center for undocumented students, which are true to CSU's core commitments of eliminating achievement gaps and fostering a campus community that is welcoming to all." Specifically, being eligible for HSI designation allows schools to apply for grants under Title III and Title V of the federal Higher Education Act of 1965. Title III grants are designed to increase the number of Hispanic students in the STEM fields of science, technology, engineering and math. Title V grants are typically used for improved advising, student internships, mentoring and tutoring, equipment and facilities, professional development, research and other programs aimed at helping all students succeed. 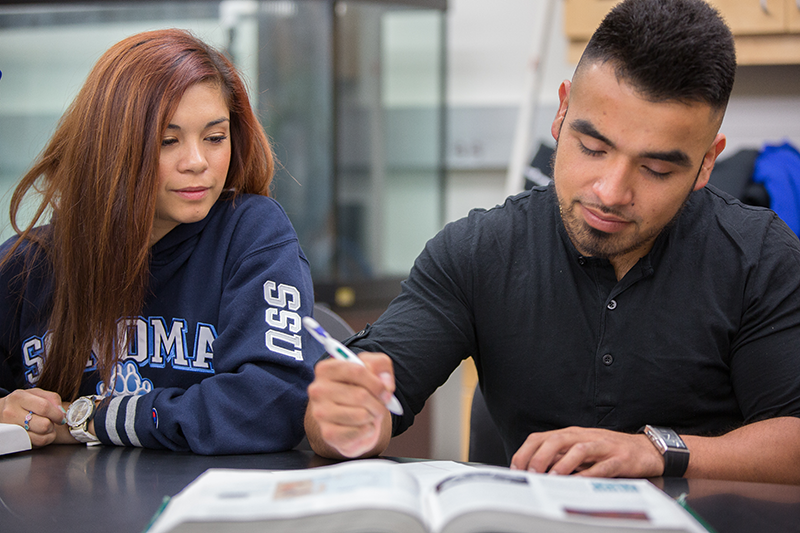 The HSI designation also waives the matching requirement for Federal Work-Study, which provides an opportunity for Sonoma State to expand student employment opportunities to low-income students from all backgrounds. HSI eligibility is also seen as bolstering California's continued economic growth, since the state has the largest Latino/Latina population in the nation. In 2015-16, 54 percent of California public school students in kindergarten through 12th grade were Hispanic. In Sonoma County, Hispanics were 45 percent of the K-12 students for that same period. Sonoma State's new Undocu-Resource Center is being coordinated by Dr. Mariana Garcia Martinez, who earned her B.A. at Sonoma State before completing her Ph.D. at the University of Illinois. "I've made it this far because many people genuinely believed in me," she said. "Our undocumented students at SSU are equally talented, and today marks an important step in advancing our efforts to support their dreams and their academic success." At the new Undocu-Resource Center in Salazar Hall students will receive dedicated academic advising from Ariana Aparicio Aguilar (B.A. Sonoma State). Laying the groundwork for the center, both Dr. Martinez and Ms. Aguilar have been providing extensive volunteer service and organizational expertise in support of Sonoma State undocumented students. Sonoma State is the 10th CSU campus to create such a center. Reflecting on Sonoma State's new developments, Dean Carlos Ayala (School of Education) and Professor Lauren Morimoto, Director of Diversity and Inclusive Excellence, are excited about the future: "Today represents an important beginning," they said in a joint statement. "Now the fun part and the challenge will be to compete for many federal grants that can strengthen support for our students and outreach to local K-12 youth." Sonoma State's application for HSI funding eligibility was submitted last December, after President Sakaki established a campus work group to secure the designation even though the university did not have the percentage of students needing financial assistance called for under federal rules. Sonoma State was able to make a compelling case that it deserved a waiver based on its overall engagement with multiple disadvantaged student populations.